Students from Testbourne Community School in Whitchurch will be taking part in the new Chelsea Fringe Festival. Their creation ‘The Wheelie Garden’ will be taking to the streets of London for two days in May and the team will be joining other horticulture enthusiasts who want to bring the joys of gardening to a wider audience. 2012 is the first year for the Chelsea Fringe – a three week festival of horticulture, performance art and community gardening that is the brain child of gardening journalist Tim Richardson. It is a parallel event to the RHS Chelsea Flower Show offering an alternative to high-end gardens and entrance fees. 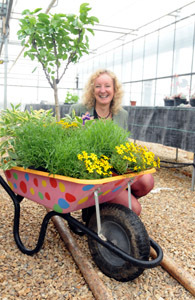 ‘The Wheelie Garden’ is being organised by Joanna Kent. Jo is a former teacher at Testbourne Community School and currently a BSc Garden Design student at Sparsholt College. She also runs her own garden design business, Gardens by Jo, based in Whitchurch. “I wanted to involve secondary school students in the project because horticulture is not on the curriculum at that age. Students need an interest in gardening to feed in to places such as Sparsholt College where they get the chance to become the next generation of garden designers and horticulturalists,” she said. Joanne is hoping to take around 20 students and 10 wheelbarrows to the Fringe. 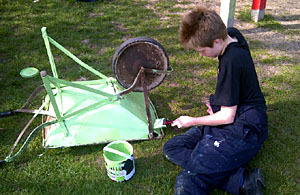 Students have been designing and planting their own wheelbarrows and they are looking really colourful. Students are able to freely express themselves with the decoration of the wheelbarrows and the plants that they choose. The Chelsea Fringe Festival runs from 19th May to 10th June at various locations, with the main focus being London. Look out for ‘The Wheelie Garden’ on 24th and 26th May on the streets of Chelsea and Battersea Park. ‘The Wheelie Garden’ is also part of the Brompton Quarter opening celebrations.